Teachers have warned that the government’s anti-extremism strategy is “shutting down” open debate in school. The National Union of Teachers conference voted for the government’s Prevent strategy to be withdrawn from schools and colleges. Delegates said it created “suspicion and confusion” rather than safety in schools. The Department for Education says it “makes no apology” for protecting young people from extremism. 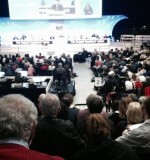 The NUT’s annual conference in Brighton heard warnings that the counter-radicalisation policy was stopping teachers from discussing “challenging ideas” with their pupils. There were warnings that it encouraged a climate of “over-reaction” in which pupils were mistakenly reported and the police called. Among the cases mentioned were a child writing about a “cucumber” which was misinterpreted as “cooker bomb” and a child who wrote about living in a “terraced” house which was misunderstood as a “terrorist” house. The conference voted to support a motion calling on the government to withdraw the Prevent strategy for schools and to develop an alternative approach to safeguarding. Teachers said they had lost confidence in being able to talk about topical issues and that this could “smother” the discussion of legitimate political opinions. Lisa Tunnell from Chesterfield said fears about pupils being reported to the police, meant that schools were not able to have “honest and open” debates. The anti-extremism strategy “disproportionately targets Muslims”, said Ms Tunnell. Gary Kaye from north Yorkshire said students would want to talk about major events in the news, such as terror attacks. But he said schools had become uncertain about what could be debated – and complained that teachers were being used as the “secret service of the public sector”. Paul McGarr from East London said students had become nervous about talking openly about the information and ideas that they might across outside school. He said that pupils would be safer and less vulnerable if they were able to debate and evaluate such ideas in a safe place in school. Alex Kenny told the conference that teachers needed to be able to help pupils to “make sense of the world”. The NUT’s general secretary Christine Blower said schools had a “moral obligation” to protect children from extremism. But she said that young people are more likely to encounter extremist ideas on social media websites rather than in school. Ms Blower said the best contribution of schools would be to encourage discussion. The Counter-Terrorism and Security Act, introduced last year, places a legal duty on schools to “prevent people from being drawn into terrorism”. It followed fears about young people being radicalised in schools and colleges, after some young people disappeared to Syria or joined extremist groups. The government has said that Prevent does not inhibit open debate and discussion, but provides the “resilience” for young people to challenge extremism arguments. A Department for Education spokeswoman said: “We make no apology for protecting children and young people from the risks of extremism and radicalisation. “Prevent is playing a key role in identifying children at risk of radicalisation and supporting schools to intervene. “Good schools will already have been safeguarding children from extremism and promoting fundamental British values long before this duty came into force.”Teachers have warned that the government’s anti-extremism strategy is “shutting down” open debate in school.